When Blu Kouzina was still being renovated, my husband and I happened to walk past when the new owner was inside. He saw and heard us admiring the aesthetics and invited us in to look around. He warmly welcomed us and told us about the concept, and about the attention to detail of the quality of ingredients, and we agreed that we would absolutely be back once they opened for business. Fast forward quite a few months and our rookie parent status meant that we were rarely taking the date nights that we needed and deserved. Well, we’ve been making a real effort to change that, and now that we’ve worked out an awesome babysitting trade deal with a close friend of ours, we are finally making time to enjoy each other and try new restaurants again. 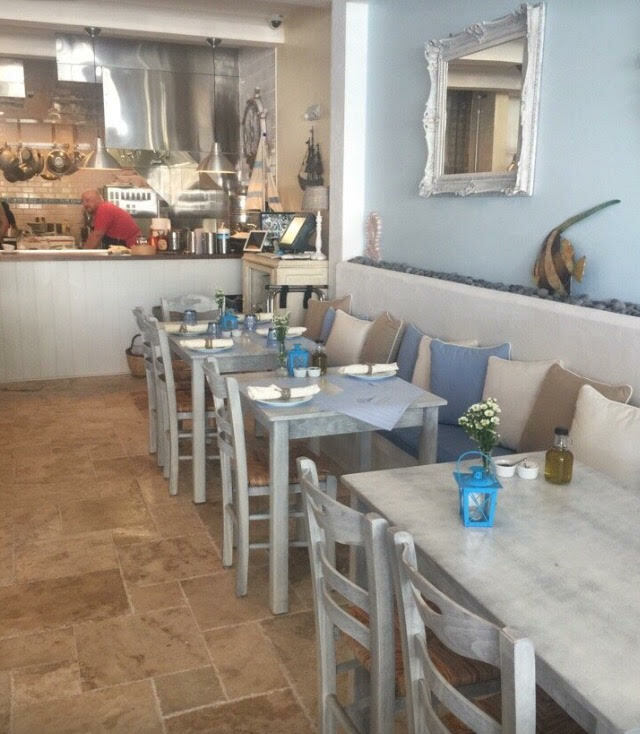 We remembered how beautiful Blu Kouzina was, and after reading MANY 4 and 5 star reviews online, decided it would be the scene of our next date. We made a reservation for 9pm (apparently channeling our former NY life) and headed out to St. Armand’s Circle. 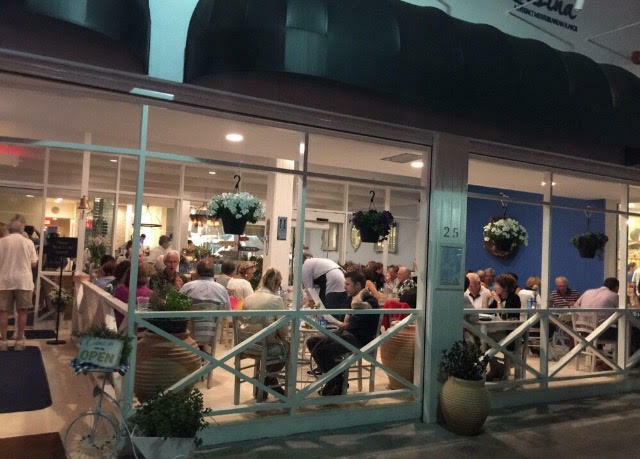 When we arrived, especially since it wasn’t yet ‘season’, we found very few other patrons and our choice of tables. We chose a corner table outside on the patio, and a waiter quickly came out to offer us beverages. One of my pet peeves is when a restaurant does not filter drinking water, and they leave you with the choice of disgusting Florida tap water, or ridiculously expensive bottled flat or sparkling water. This was, in retrospect, the ONE real gripe I have about our whole experience. Our bottle of water was $8. EIGHT dollars. We finished it halfway through our first course and ended up too thirsty but too cheap to do anything about it. Not cool at all. Anyway, moving on. We decided to order 3 appetizers to share, partially because it was late for a huge meal, and also because we had a coupon for a free sundae at Ben and Jerry’s that we absolutely intended to use that night for part two of our date. 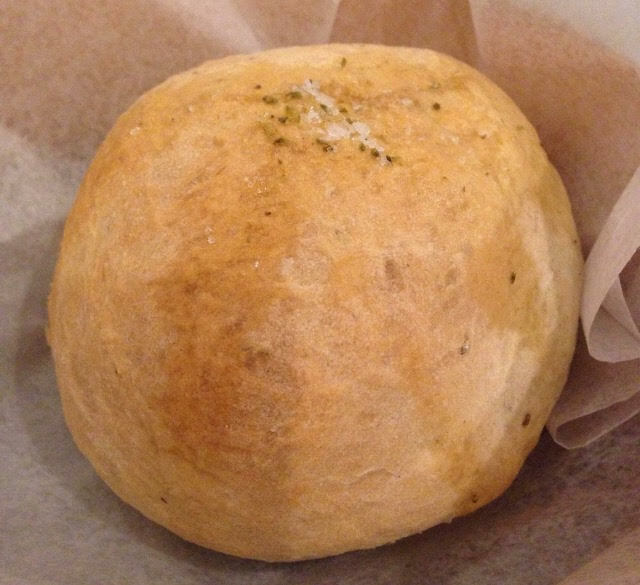 The waiter brought out a couple of rolls for us as well as a side of excellent herbed olive oil. The rolls, we discovered, were cold, and I thought maybe even a little stale. I wondered to my Hubs if that was the way they were supposed to be, or if our late dining time meant that fresh rolls just weren’t happening for us. I thought about saying something, but I was hungry enough that I didn’t really care. We didn’t find out until we asked for second rolls a bit later that those first ones *were* in fact less-than-fresh…and the next batch was hot, crusty, and really pretty darn perfect. Well, now we know for next time. We asked for our appetizers to be brought out in whatever order they were ready, and the Xtapodi Shara (Grilled Octopus) came out first, followed shortly after by the Horiatiki (Greek Salad). The waiter told us that the Spanakopita was made to order and might be a bit longer, which was totally fine with us. The octopus deserves it’s own paragraph. I can honestly say that this octopus has now ruined me for every other octopus I’ve ever eaten. It’s a food I’ve always loved, and was actually one of my baby girl’s first ‘real’ foods at around 7 months old, which I find pretty hilarious. Anyway, I always thought it was supposed to be slightly chewy but now that I’ve had this impeccably fresh, perfectly grilled, lightly flavored with olive oil and lemon version, I realize that NO! It does NOT have to be chewy at all. It can be melt-in-your-mouth, bursting-with-flavor, tender, sweet, amazingness. Seriously delicious and worth going back for without question. I probably could have ordered another one and easily polished it off by myself. The Greek salad was bright and refreshing, consisting of tomatoes, cucumber, onion, olives, homemade feta cheese and green pepper, topped with extra virgin olive oil and organic vinegar. It was of superb quality and dressed lightly, which contrasted so nicely with the heavier parts of our meal. The spanakopita came out when we were about halfway done with our salad which was great timing. They were piping hot and super flaky, and the spinach/feta/herb inside was decadent and delicious. I’ve had a bunch of different versions of this dish before, but it’s doubtful that any of them were homemade-to-order, and it really showed. Just to briefly touch on the atmosphere since it’s what made me want to try Blu Kouinza in the first place, I found it incredibly appealing. It has a Nantucket-meets-Greece feeling with a mix of blues, refinished furniture, lanterns, and candles. Throw pillows and hanging flower baskets give it a homey, comfortable feel, and the open kitchen adds a sense of dining at a friend’s place. This ambiance is a huge part of what made this experience complete for me, and I couldn’t stop commenting on what great taste the owner has. The attention to detail clearly shows in both the decor as well as the food. This was one of my favorite meals that I’ve had in a long time, and I wouldn’t hesitate to recommend it to others or to return on another date night. I’m so glad we finally made it there and hope we can get back again soon. Bravo!